Having arrived in New York to pursue their passions, a brooding British violinist and beautiful ballet student learn to face the music and dance over the course of this pleasant if admittedly predictable Fame meets Once style musical romance. 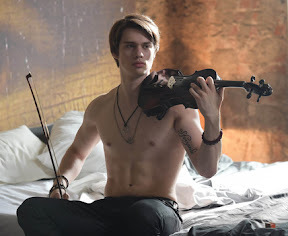 Named Ruby after a Balanchine ballet and seemingly destined for a life on the stage, in High Strung, Keenan Kampa’s first year Manhattan Conservatory of the Arts student struggles to dance with her heart instead of her head – similar to the way that Nicholas Galitzine’s busking violinist Johnnie does while composing by ear with the world as his muse. Nonetheless believing that “dancers dancer no matter what,” once the two cross paths in the midst of a robbery that finds Johnnie’s beloved grandfather’s violin stolen, Ruby is more determined than ever before to follow her heart and make things right. After some early push-and-pull which is vividly brought to life in a terrific tango sequence that gives the film a much-needed shot of adrenaline, Ruby joins forces with the initially reluctant musician to compete for a prize that could pave the way to both of their dreams. While fans of the well-tread genre know precisely where the film and its characters are headed, fortunately for director Michael Damien (who penned High Strung alongside wife Janeen Damian), few audiences are as loyal or forgiving of flaws as song and dance movie devotee, as this fan can personally attest. Hindered by blandly written characters and (everything but the dance numbers) by-the-numbers dance picture predictability, although the film’s otherwise talented leads don’t exactly set the screen ablaze with their less than fiery chemistry, the affable cast never fails to give it their all. Shining its brightest when High Strung’s musical performances take Center Stage, the high in energy yet low in originality movie manages to distract us from the inevitably triumphant conclusion with Viorel Sergovici’s lush cinematography, Nathan Lanier’s stellar score, and Dave Scott’s innovative choreography. Having graduated to features after helming a series of memorable TV movies and direct-to-disc hits (including a few terrific Flicka sequels), High Strung marks an admirably ambitious undertaking by director Michael Damian. A refreshingly clean spin on Dirty Dancing-like material safe for the High School Musical or Teen Beach Movie set, while perhaps it’s only mildly successful in its own right, High Strung will undoubtedly to appeal to genre lovers eager to Step Up for another opportunity to Save the Last Dance.